Early Monday morning on June 7, 1999, I left Orlando, Florida (where I was vacationing with my partner, but had brought a suit and dress shoes along, “just in case”), and flew to Washington DC, where I stored my luggage at the airport, and then took a taxi directly to the White House. That afternoon, I proudly stood in the Oval Office with about thirty other Asian American and Pacific Islander community leaders to witness the signing of Executive Order 13125 by President Bill Clinton, establishing the White House Initiative on Asian Americans and Pacific Islanders. This is the story of my involvement with that Initiative, which twelve and a half years later, celebrates its second-year anniversary today under President Barack Obama. This story begins in 1997, when I was working at the Asian & Pacific Islander American Health Forum (APIAHF), a national health policy organization advocating for Asian American and Pacific Islander (AAPI) communities. Soon after the inauguration of President Bill Clinton, AAPI health organizations began seeking more attention to AAPI health issues from the new administration. Then, at the Intercultural Cancer Council conference in April, fierce patient advocate Susan Shinagawa publicly asked HHS Deputy Secretary Kevin Thurm when HHS was going to pay more attention to the unmet needs of Asian Americans and Pacific Islanders. Thurm responded that he would meet with Asian American and Pacific Islander community health leaders to discuss our concerns. On May 7, Thurm met with us and we were all surprised when he committed right then and there to establish an HHS departmental initiative that would focus attention on Asian Americans and Pacific Islanders. He outlined a plan for the department to convene a high level internal working group, conduct an inventory of programs that served the Asian American and Pacific Islander communities, and create workplans that would increase the engagement and participation of Asian American and Pacific Islander communities in the department’s programs and grants. Three community coordinators were named to assist with community education and outreach: Stephen Jiang, executive director of the Association of Asian Pacific Community Health Organizations for Asian Americans, Dr. Pua Aiu, research director of Papa Ola Lokahi for Native Hawaiians, and Marie Ma’o, from the American Samoa Department of Health for Pacific Islanders. Dr. Stevenson Quartei from the Republic of Palau Ministry of Health later assumed Ms. Ma’o’s responsibilities as community coordinator for Pacific Islanders. On September 9, Thurm announced the adoption of the draft framework and directed the development of action plans by all HHS operating divisions and staff divisions to implement the HHS AAPI initiative. At our national APIAHF “Voices from the Community” conference later that week Dennis Hayashi and Stephen Jiang described the HHS AAPI Initiative and received community input and feedback from the 400 conference participants. We were all excited about the momentum and progress being made to highlight the many unmet needs for health and social services in our AAPI communities, and eagerly looked forward to HHS’ work in the coming months. 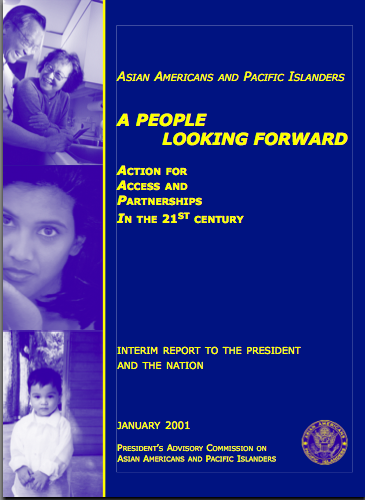 On November 10, 1997, HHS published the Framework for the Asian American and Pacific Islander Initiative and the Action Plans from each HHS operating division and staff division implementing the Initiative. 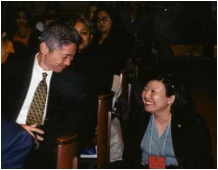 Then sometime in December 1997, I walked into the office of my executive director at APIAHF, Tessie Guillermo, and said to her that as much as we should celebrate what we had achieved with the HHS AAPI Initiative, we needed to find a way to continue the work beyond the supportive leadership of Deputy Secretary Thurm and HHS. Based on my background as a civil rights lawyer, I suggested that we explore the possibility of a presidential executive order that would elevate the HHS initiative to become a federal government-wide initiative, administered by the White House. Tessie immediately gave her complete support to pursue the exploration. After spending time at the law library researching executive orders, I wrote a first draft of an executive order establishing a White House Initiative on Asian Americans and Pacific Islanders, and creating a President’s Advisory Commission on Asian Americans and Pacific Islanders. I used language from prior executive orders establishing the White House Initiative on Historically Black Colleges and Universities, the White House Initiative on Educational Excellence for Hispanics, and the White House Initiative on Tribal Colleges and Universities (notably, there had never been a comparable initiative for Asian Americans and Pacific Islanders). There would be an administrative base for the initiative at a federal department (HHS) and a presidentially-appointed advisory commission. There had to be a unifying focus for the initiative so I wrote that the initiative would seek to improve the “health and well-being” of AAPIs, based on the World Health Organization definition of health. In early 1998, we began to circulate the draft to our key contacts at HHS, and at the White House. Our APIAHF Washington DC staff person, Dong Suh, was amazing in single-handedly pressing for the idea at countless meetings and getting additional support from other national advocacy organizations based in the nation’s capitol. HHS Deputy Secretary Thurm again provided vital support to our efforts when he publicly endorsed the idea of an executive order at a March 1998 conference sponsored by the Health Services and Resources Administration (HRSA), which was one of HRSA’s activities in its workplan for the HHS AAPI Initiative. HRSA Administrator Earl Fox also publicly supported the idea of an executive order. The same week of the HRSA meeting, Dong and I met with Doris Matsui, Deputy Director of the White House Office of Public Liaison (and wife of Congressmember Robert Matsui), staff from the Office of Budget and Management, and staff of the members of the Congressional Asian Pacific Caucus, to strategize how to get the executive order issued. We hoped to get the executive order issued sometime that May of 1998 since May is Asian Pacific American Heritage Month. Over the next months, we organized letter-writing campaigns to the White House, and Dong continued to meet with HHS and White House officials, including Chief of Staff Erskine Bowles. However, by the fall of 1998, with no action imminent, it became clear that a more public mobilization was required to focus attention on the executive order. In September 1998, APIAHF initiated a community mobilization and letter-writing campaign to urge issuance of the executive order. Dozens of letters from AAPI community organizations and advocates were sent to the White House, HHS, and the Congressional Asian Pacific Caucus. In November, AAPI community leaders met again with Doris Matsui of the White House to reiterate community support for the immediate issuance of the executive order. She commended our advocacy and encouraged us to keep pressing forward. In January 1999, Dong met with new White House Chief of Staff John Podesta. On February 18, 1999, the leading national Asian American newspaper, AsianWeek, published an opinion editorial that I had written, explaining the idea of a White House Initiative on AAPIs and calling for the immediate issuance of the executive order. 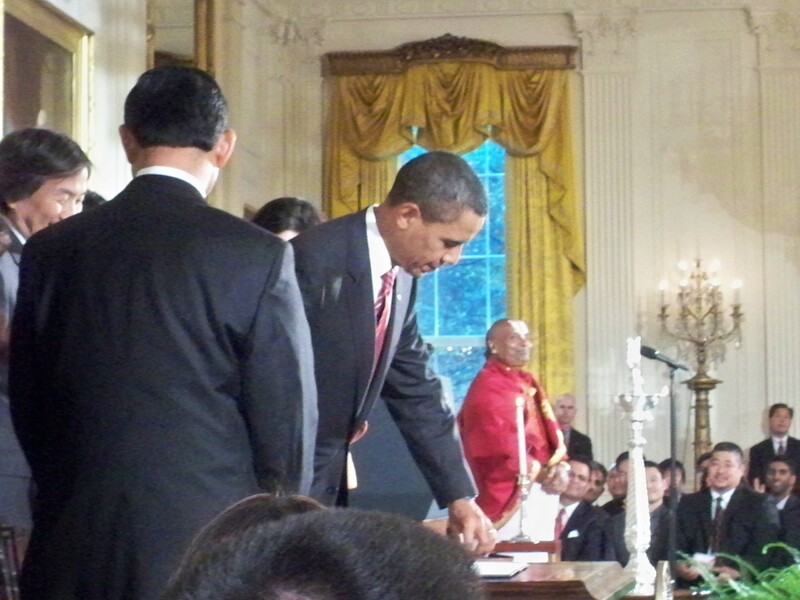 As May 1999 approached, another effort was made to time the issuance of the executive order with Asian Pacific American Heritage month. Throughout April and May, APIAHF worked with HHS and the White House to prepare for the issuance of the executive order. The draft of the executive order had been edited and amended several times but the essential elements from my first draft survived. To my surprise, it was suggested that the scope of the Initiative be “to improve the quality of life of Asian Americans and Pacific Islanders through increased participation in federal programs where they may be underserved”, a far broader scope than what I had first drafted. Required internal supporting documents regarding staffing, budgeting, and other important administrative processes were finalized. Under the leadership of Earl Fox, HRSA volunteered to house the Initiative office and provide the operational support needed for initial implementation. Then in June 1999, the day finally came when the executive order was to be signed and implemented. For those of us in the Oval Office that day, we felt keenly the tide of history turn as we were very conscious of the fact that the only other executive order that had focused specifically on the Asian American community was Executive Order 9066, authorizing the forced relocation and imprisonment of 120,000 Japanese Americans, the vast majority who were U.S. citizens, during World War II. This effort was not achieved by the usual measures of political power or effectiveness. One national organization, APIAHF, with three staff members (Dong, Tessie and myself) working part-time on this effort over a year and a half, led the community advocacy efforts. A handful of HHS and White House staff shepherded the process through the complexities of the federal government bureaucracy. We did not have the usual infrastructure, money, votes, or power to make an impact across the entire federal government. 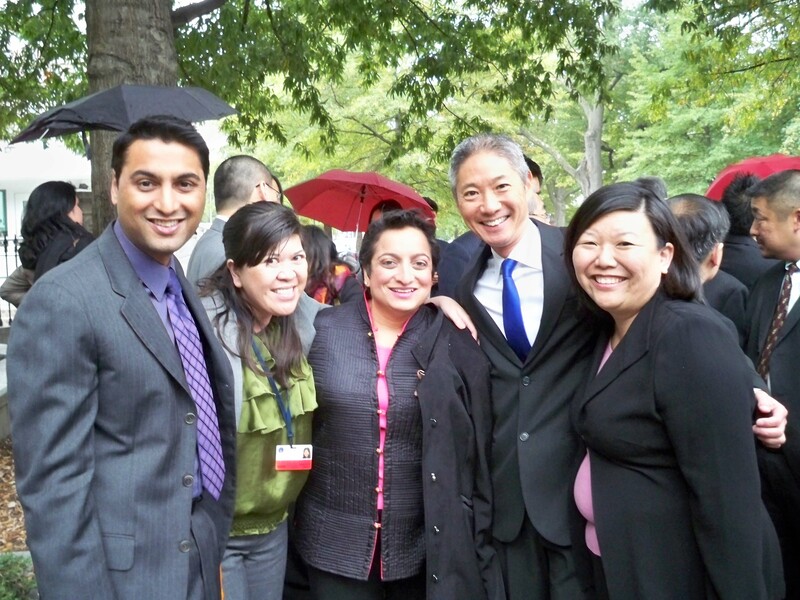 The speed with which the HHS AAPI Initiative first progressed, and then how we were able to move the concept to the level of the White House was unprecedented. The idea took off and everyone kept working towards the goal of getting an executive order issued. We succeeded, beyond any of our imaginations. 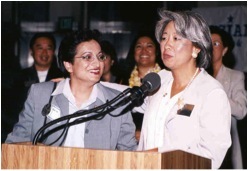 Throughout the remainder of 1999, the White House Initiative on Asian Americans and Pacific Islanders became a reality under the leadership of Executive Director Shamina Singh, with Ruby Lam, Lisa Hasegawa, Charmaine Manasala, Tyson Nakashima, Parag Mehta, Christie Onoda, and Angela Comeau assuming vital roles as the Initiative staff. An Interagency Working Group, chaired by HHS Deputy Secretary Thurm was established, with representation from 14 federal departments and 18 federal agencies. A staff-level Coordinating Committee, co-chaired by Shamina Singh and Deputy Assistant to the President and the new Deputy Director of the Office of Public Liaison Laura Efurd, also was convened. 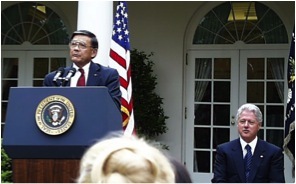 The first-ever President’s Advisory Commission on Asian Americans and Pacific Islanders was named by President Clinton in May 2000, chaired by former Congressmember Norman Mineta. My executive director at APIAHF, Tessie Guillermo, was appropriately honored by being named one of the inaugural Commissioners (as was Dennis Hayashi, who had left HHS and become the director of the California Department of Fair Employment and Housing). When Mineta was appointed by President Clinton as Secretary of the Department of Commerce in July, former Seattle City Councilmember Martha Choe was named as Commission chairperson. The first public meeting of the President’s Advisory Commission on Asian Americans and Pacific Islanders, a community town hall meeting in Los Angeles on July 24, was another momentous day for me. To see a stage full of community leaders now recognized as presidentially- appointed “commissioners”, to have representation at the highest levels of the federal government in attendance, and then to hear the eloquent testimony of dozens and dozens of AAPI community leaders on a myriad of issues, almost took my breath away. I was so incredibly proud to see faces that looked like me in all these roles, and to feel that we had created this unprecedented working relationship between the federal government and our AAPI communities. The Commission held an additional public meeting in Seattle on August 21 and another community town hall meeting in New York on September 18 (during a torrential rainstorm). The two town halls also had teleconference links to 22 additional cities in Arizona, California, Colorado, Connecticut, Maryland, Massachusetts, Nevada, New Mexico, New York, Oregon, Pennsylvania Rhode Island, Texas, Virginia, Washington, and Washington DC. During that summer, the Commissioners, Initiative staff, and federal representatives also held community forums, roundtables, and receptions in Washington DC, Philadelphia, Boston, Houston, St. Paul, Chicago, Seattle, and ten cities in California. I was honored to be asked to assist the Commission write its first report and so I took a temporary leave of absence from APIAHF to work on the report. Immediately after the town hall meeting in New York on September 18, I focused on the writing of the report. Faculty and graduate students at Georgetown University, led by Professors J.P. Singh and Diana Owen, assisted by compiling materials received from 14 federal departments and 18 federal agencies. I read all the federal inventories and workplans and made sure that my draft incorporated items from every one of the departments and agencies. I re-read the transcripts and written submissions of the over two hundred AAPI community leaders who had testified at the Commission town hall and other meetings. I ended up referencing 95% of the testimonies to ensure that those who testified could see in the report that the Commission had heard them and had documented their issues, concerns, and recommendations for posterity. I also argued that we needed to include their contact information in the report so they would be viewed as community experts and resources for the federal government as it implemented the initiative. I collected every report from AAPI community organizations and every relevant book or article that I could find to use as background resources and citations. As Commissioners, we collectively assert the right of our Asian American and Pacific Islander communities to be “at the table” – to be fully included in all the promise and opportunity that the United States has to offer in its noblest and greatest traditions. At the same time, as appointees to a federal advisory commission, we also take extremely seriously our own and our communities’ responsibilities to fully participate in our government and contribute our unique expertise, skills and gifts. In the spirit of partnership, we also call upon those Asian Americans and Pacific Islanders who have achieved educational and economic success to join us in supporting and actively participating in these federal government and community-based efforts with both their experiences and resources. Together, we can proudly look forward to transforming our communities and all of America. After 23 days of intense writing and editing, I submitted a draft report (of over 100 pages) to the Initiative staff and the Commissioners on October 11. The Georgetown University team submitted another 100 pages containing the federal department and agency inventories and workplans. The Commissioners met by conference call on November 9 to approve the report. After incorporating edits from the Commissioners, Initiative staff, and technical advisors, I prepared a final draft on November 27. The report then had to work its way through both the HHS and White House “clearance” process, undergoing additional edits. Asian Americans and Pacific Islanders have been “MIH” – “Missing In History” – as taught in classrooms, as reflected in the media and the arts and as understood by government policymakers and program planners. In much of the data used by the federal government, Asian Americans and Pacific Islanders are invisible, relegated to a residual category of “Other.” Asian Americans and Pacific Islanders are challenged to reclaim and re-insert their history, their stories, their faces, their voices and their lives into American history and America’s future. Native Hawaiians and Pacific Islanders often remain a footnote or asterisk as part of the broad “Asian American and Pacific Islander” category, ignoring their importance and dignity as diverse, indigenous peoples. Barely ever noted is the manner in which the United States acquired Hawai’i, Guam, the Commonwealth of the Northern Mariana Islands, and American Samoa. Asian Americans are stereotyped as a “model minority”: passive, compliant, overachieving and without problems or needs. Asian Americans continue to be viewed as perpetual foreigners, forever “aliens” whose loyalty and place in America is always questioned. The goal of the Executive Order is to improve the quality of life for all Asian Americans and Pacific Islanders but particularly for those that have been underrepresented and overlooked. As a Commission, we specifically recognize some members of our Asian American and Pacific Islander communities who often have been ignored and marginalized, both by our own communities as well as general American society. We have heard your calls for recognition and inclusion in this effort to improve the quality of life for all Asian Americans and Pacific Islanders. To our indigenous Native Hawaiian and Pacific Islander brothers and sisters, we fully support your self-determination and reconciliation, while urgently seeking a greater commitment and investment by the federal government to address the many health, education, housing and economic disparities that you continue to experience. To our immigrant and refugee Asian American and Pacific Islander sisters and brothers, we welcome your full participation in our nation’s life while committing to reducing the linguistic, cultural and social barriers to access and equal opportunity. In particular, we recognize the many economic contributions made by Asian American and Pacific Islander immigrants, including undocumented immigrants, and seek vigorous enforcement of all laws to protect you from discrimination and exploitation. To all Asian American and Pacific Islander women, we honor the roles that you play in all aspects of the economy, our families and communities, often at the cost of your own health and well-being. We want to challenge the particular and persistent inequities that you face in our families, in education, and in employment and business opportunities, both in our own Asian American and Pacific Islander communities and in American society in general. To our multiracial Asian American and Pacific Islander sisters and brothers, we pledge to work with you in defining and refining our societal notions of racial and ethnic identity, to ensure your inclusion and representation in all our discussions of what it means to be Asian American or Pacific Islander. You are an important bridge to overcome some of the barriers and divisions among all Americans. To Asian American and Pacific Islander intercountry adoptees, we are committed to assisting you in your journeys to claim your birth identities and heritage and to help build bridges between families, cultures, races and nationalities. To our Asian American and Pacific Islander brothers and sisters with disabilities, we are committed to work with you to eliminate the barriers, both physical and attitudinal, to your full participation in all our communities and in all federal programs. These are basic civil and human rights that you are entitled to. To Asian American and Pacific Islander survivors and victims of domestic violence, we challenge all of us to do more to break the silence around domestic violence and ensure that comprehensive, linguistically accessible and culturally competent services are available to you and your families. To our Asian American and Pacific Islander gay, lesbian, bisexual and transgender sisters and brothers, we want to explicitly recognize your presence and contributions and join you in condemning and changing the ignorance and prejudice that keep you invisible, threaten your physical, mental and emotional health and deny all of us your talents and gifts. We reject all forms of discrimination and exclusion because of sexual orientation, gender identity or gender expression. To our Asian American and Pacific Islander elders and seniors, we honor all that you have sacrificed and risked for ourselves and our families. We seek to ensure that your lives are lived with a sense of security and respect. We will continue to celebrate the proud legacy of our ancestors. To our Asian American and Pacific Islander youth, we recognize both the pressures and the opportunities that you face as our collective hope for the future. We acknowledge the very real, daily stress of growing up in today’s world, often torn between the traditional values and cultures of your parents and grandparents and the rapidly changing, increasingly technological, modern world. Our work as a Commission is in large part inspired by our commitment to doing what we can to ensure that your futures are ones in which your highest aspirations and loftiest dreams are realized. And to our Asian American and Pacific Islander veterans, we express our gratitude for your service and sacrifice to our nation and we join with you to express our loyalty and pride in public service while demanding equity in all veterans’ programs and services. We honor you as living examples of the best of American patriots. We call upon our own Asian American and Pacific Islander communities and the federal agencies to recognize and include all our sisters and brothers as we all work together to build a better future for all of America. As the first Presidential Advisory Commission on Asian Americans and Pacific Islanders, we are acutely aware of our obligations to our families and our communities to translate what we have heard and learned into recommendations that will result in meaningful, measurable and sustainable programmatic changes that increase access for and participation by Asian Americans and Pacific Islanders in federal government programs. As a Presidential Advisory Commission, we will proactively and aggressively use the platform created by this White House Initiative to inform, educate and advocate about the critical issues and needs as well as the valuable assets and resources in our Asian American and Pacific Islander communities. As pervasive and persistent as our communities’ needs are, we resist and reject a “deficit model” that requires us to identify and document our needs and concerns, only to compete with others who are marginalized for scarce and shrinking resources. Instead, we proudly assert our community strengths and assets, and a sense of community empowerment to share in the solutions to our needs and issues. At the same time, we invite the federal government to partner with our communities to maximize resources and to increase both the effectiveness and efficiency of federal government programs. We will continue to depend on the assistance, cooperation and partnership of both the federal government and the Asian American and Pacific Islander communities in making the promise of this Initiative a reality. The day after the report was released, I was at an APIAHF staff retreat being facilitated by my friend and colleague Kevin Fong. Kevin changed the agenda for the retreat and invited me to explain how the report was the culmination of so much work by APIAHF, and such an important milestone for our AAPI communities. It was the first time I could tell the full story to the entire APAIHF staff, and share my sense of pride and accomplishment with all of them. Despite the change in Presidents, the White House Initiative on Asian Americans and Pacific Islanders was continued under President George W. Bush, who issued Executive Order 13334 (in May 2004, re-establishing the Initiative for two years through May 2006) and Executive Order 13403 (in May 2006, extending the Initiative for one more year, through May 2007). 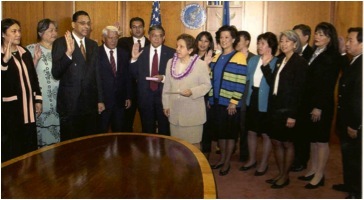 Consistent with his Administration’s priorities, President Bush did move the staff of the Initiative to the Department of Commerce and focused the work of the initiative on “providing equal economic opportunities for full participation of Asian American and Pacific Islander businesses in our free market economy where they may be underserved and thus improving the quality of life for Asian Americans and Pacific Islanders.” In May 2007, the Commission issued its report, “Enhancing the Economic Opportunity of Asian Americans and Pacific Islanders”. 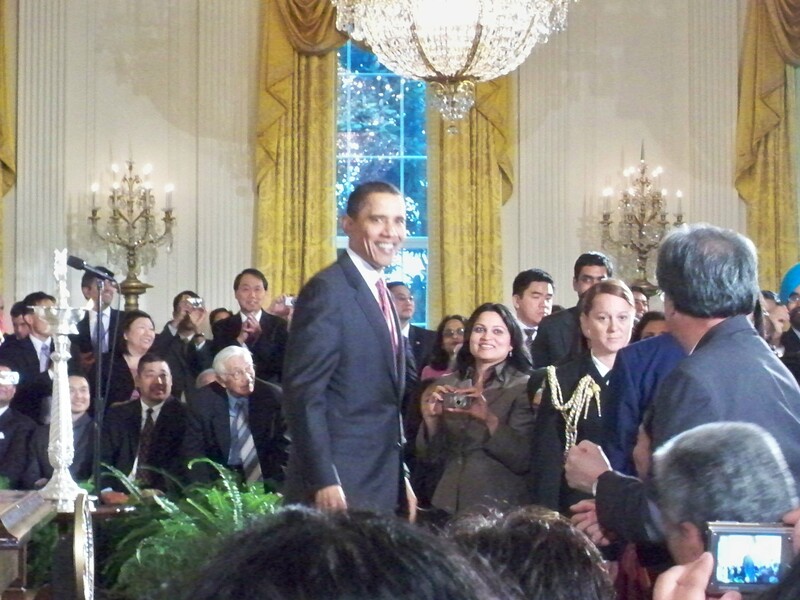 When Barack Obama ran for president in 2008, one of his campaign promises was to re-establish the White House Initiative on Asian Americans and Pacific Islanders. 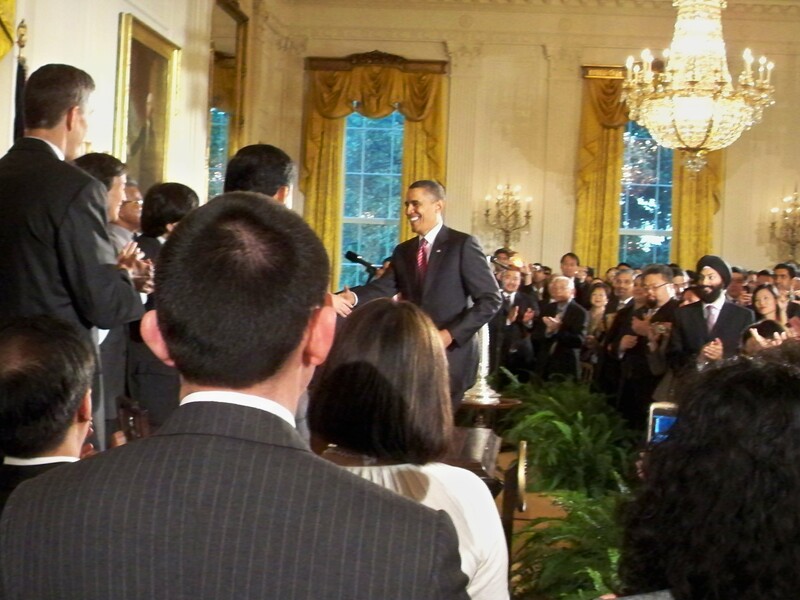 On October 14, 2009, I was privileged to again be invited to the White House, this time with hundreds of others, to witness President Obama re-establish the White House Initiative on Asian Americans and Pacific Islanders by signing Executive Order 13515. Many of us who had been involved in the first initiative had a mini-reunion as we celebrated that day. The Initiative is now based at the Department of Education and co-chaired by Department of Education Secretary Arne Duncan and Assistant to the President and Cabinet Secretary Chris Lu. It had been co-chaired by Department of Commerce Secretary Gary Locke, until his appointment as U.S. Ambassador to China. President Obama named 17 members to the re-established President’s Advisory Commission on Asian Americans and Pacific Islanders, and last week added three additional Commissioners, including Olympic speed skater medalist Apolo Ohno. Initiative Executive Director Kiran Ahuja and her tremendous staff continue the great work, hosting over 200 events and workshops in 50 cities in 23 states, Washington DC, and the Pacific Islands that have reached more than 22,000 people. This week, the Initiative issued a two-year report on its accomplishments, continuing this remarkable partnership between the federal government and the Asian American and Pacific Islander communities, living up to the American promise of a government of, by, and for its people. This entry was posted in Asian American, Native Hawaiian and Pacific Islander Health, Author, Participant, The iBau Blog, White House Initiative on Asian Americans and Pacific Islanders. Bookmark the permalink. This needs to be required reading for Asian American Studies classes. Love me some @Ignatius Bau! Wow, Ignatius! You never stop amazing me with all you have and continue to do! Congratulations on this ongoing achievement and all that it means to help promote health equity! Ignatius, as I am preparing for a speech for the WHIAAPI, I read your tremendous documentation of the WHIAAPI! Thank you so much for writing down a vital part of AAPHI history! I have just sent the piece out to members of the President’s Advisory Commission on AAPIs for them to read as you have so eloquently articulated our continued work on behalf of our community. And we are always so happy to have you at our WHIAAPI events! Thanks Daphne! Thanks for your continuing leadership of the Commission!